Meet nine-year-old Denavi. She was diagnosed with Plelaan McDermid syndrome, a rare illness that is related to autism. She suffers from countless trials. Denavi is incapable of speech, but she can express herself with certain sounds. She also cannot walk without a gait trainer. Denavi has only one partially functioning kidney, which limits her diet. Much of her life has been in hospitals, doctor’s offices and therapy centers. She is described as a perfect child regardless of her situation. Simple things help Denavi to get through her day. She likes several types of music. She has an illuminating smile whenever she hears songs by Enrique Iglesias like Bailando. Denavi also enjoys getting messy with her hands during art class. Sometimes Denavi has a bad day, and mom will cradle her daughter while singing “You are My Sunshine.” The song title is appropriate. Denavi is a bright ray in a dark day. She is perfection in an imperfect world. 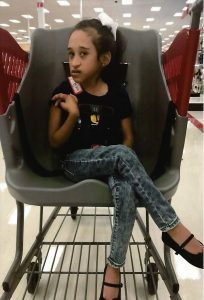 Denavi needs an adaptive tricycle to improve her leg strength and coordination. Please be a giving donor for her soon!